Equity. Diversity. Inclusion. I heard these powerful, complicated words reduced to the acronym “EDI” for the first time last week at a meeting — and while this signal of ubiquitous discussion encourages me, I felt the abbreviation packages them up a little too neatly. What does it mean for an organization to value diversity? How does equitable practice weigh history and lived experience? Whom do we, as architects and designers, seek to include, and how does that adjustment impact the design process? 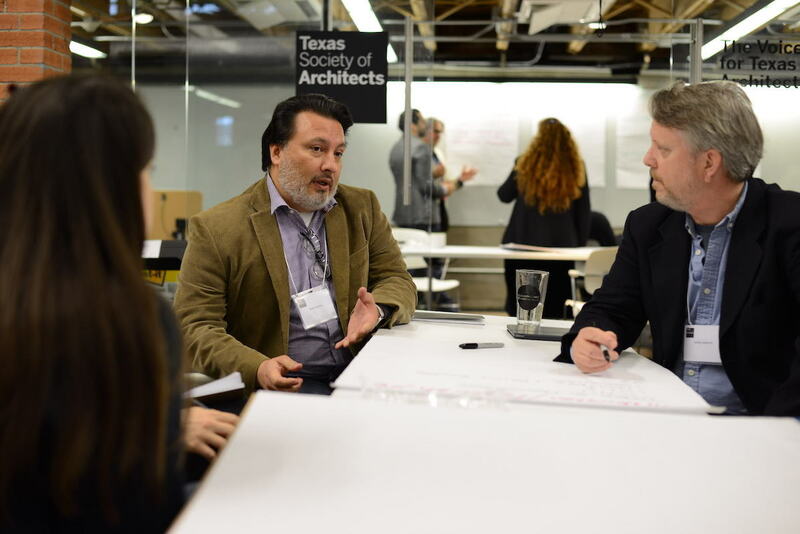 In January of this year, colleagues from across the state gathered in Austin to wrestle with questions about equity, diversity, and inclusion at the Texas Society of Architects’ first annual Community Design Summit. Compared to traditional practice, where hiring patterns and high-level policies tend to check the EDI boxes, community design gets straight to the heart of designing with equity and inclusion in mind. TxA hosted the Summit as a touchpoint for practitioners actively engaged in serving underrepresented people and causes through design application: some who do so full-time, and some who make ways to serve either in or adjacent to careers in mainstream architecture. We met Thursday evening for an Equity Dinner (sponsored and organized by the AIA Austin DesignVoice committee), which featured local speakers and guided dialogue shared together over a delicious meal. All day Friday, Summit attendees shared their own experiences, identified gaps in the system, and discussed actionable ways that TxA could support community design in the state of Texas. Summit attendees now sit on a TxA action team that will start work on some of these proposals. So what is community design? Many people apply phrases like “community-based” and “public interest” in an attempt to make nested concepts more specific, and in so doing identify a range of specialties and actors. Dr. Barbara Brown Wilson of the University of Virginia School of Architecture (and past professor at UT Austin) developed an incredibly helpful graphic that charts these ideas as part of a continuum, illustrating that community or social impact design approaches might be as varied as the problems they seek to address. At the Summit, we discussed the importance of sharing these unique tools at our disposal and using them to their best effect. 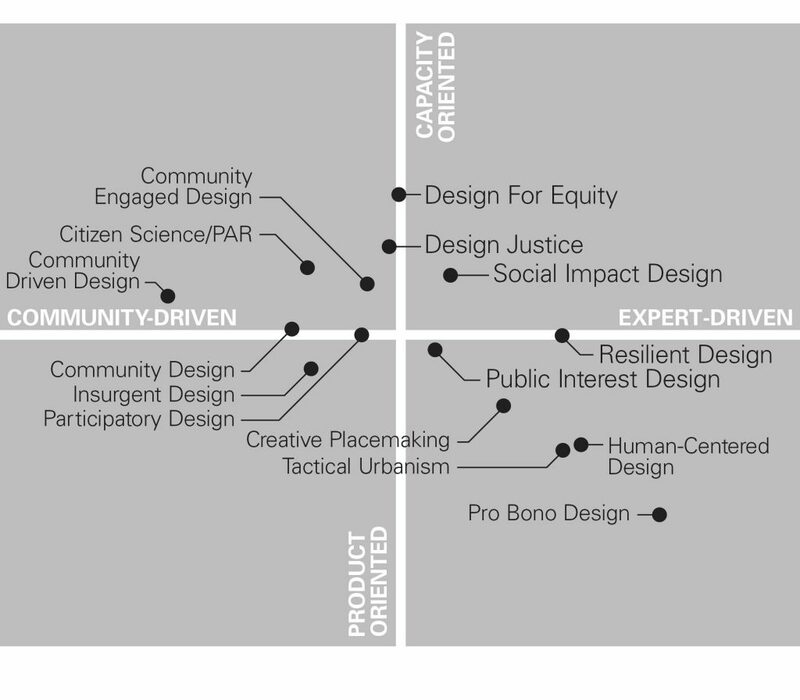 Community design in practice usually indicates diverse, equitable, inclusive methods. Its true strength, however, comes not just from checking these boxes, but from the stories that emerge from a process that’s not often linear or predictable. Stories help us engage with that richness and complexity, especially if we’re not afraid to talk about struggles and mistakes along the way. To that end, the action team plans to document and disseminate case studies of community design across the state. Please send us your ideas and stories; we’d love to share them. Community design, like any diverse, equitable, inclusive initiative, requires that we surround ourselves with people who think differently than we do. They’ll challenge our preconceptions, for better and for worse. But the more we practice, the better we’ll become at listening, asking good questions, and getting comfortable with dissonance. Let’s keep it complicated. Want to organize your own Equity Dinner? Download the free kit from Design for Equity here!